Some two hundred people gathered in Brussels to watch the official launch of the European Green Party's campaign for the EU election campaign in May. The Greens have polled poorly in a number of member states. They could lose their spot as fourth largest political force in the European Parliament in the next European Parliament. 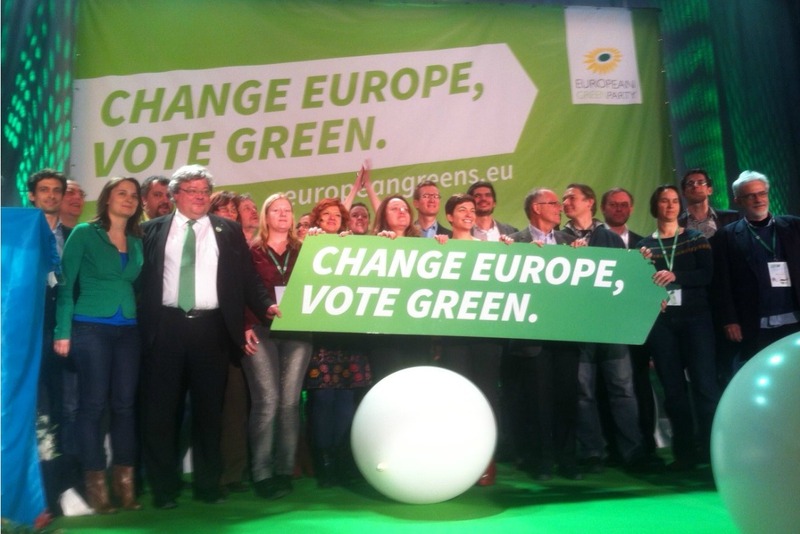 The party showcased their campaign material, which includes a series of posters with the tagline “Change Europe, vote Green”. The posters can be customised online by national parties or Green party supporters. The main point of the convention was the adoption of the Greens’ manifesto: a common programme that will be used in national green parties’ campaigns. The text spells out a ‘Green New Deal’ that focuses on the promise of green jobs and sustainability in Europe. Social justice is also high on the Greens’ common programme, which criticises the EU’s austerity-driven response to the crisis as well as the lack of resources to underpin job creation schemes. Green politicians also scorned EU policymakers for allowing GMO-produced food onto the European market, and for putting in danger social and environmental standards in the ongoing negotiations for a free trade agreement with the United States (TTIP). A final version of the manifesto will be published early this week, party representatives said on Saturday. After the Alliance of Liberals and Democrats for Europe, the Greens are the second party to adopt their manifesto at an electoral congress. Later this week, the Socialist PES party gathers in Rome for their campaign kick-off; the centre-right EPP party has scheduled its congress for 6-7 March in Dublin. The Greens engaged in what they called the “first primary process” of a European party, selecting two figureheads to be their European campaign faces in an online poll that ran from November until the end of January. According to Keller, “the primary was a warm-up – now we are ready for it. Europe needs green answers; let’s go out and fight; let’s change Europe”. Ska Keller was elected the party’s frontrunner for the European elections, together with French member of the European Parliament José Bové. These two frontrunners also serve as the Greens’ designate Commission president candidates to succeed José Manuel Barroso, but the party itself admitted they o not have a shot at such a top position. Bové was even absent at Saturday’s election convention. Party representatives explained the French politician was participating in a protest rally against the construction of an airport in Nantes, France, leaving it up to Keller to motivate the European party’s members. The Greens are hoping to keep their seats in countries like Sweden, the United Kingdom and Austrian so as to maintain their presence in the European Parliament. The battle ground for the party is set to be in France and Germany, countries that will be key if they are to curb their expected decrease in seats. The French Europe Ecologie currently has 15 seats in the EU parliament but could fall back to as little as 5 seats, PollWatch data shows. In Germany, Bündniss 90/Die Grünen could lose another 3 seats, falling back to a total of 11. Frassoni toned down the negative news, telling EURACTIV that “it is very difficult to foresee what will happen in many countries. We believe a European campaign can be very helpful in Spain, Hungary and a couple of other places, but we try to make a Europe-wide campaign and to offer our services". The Greens face strong pressure from parties on their political left. Latest data has shown the far-left European United Left/Nordic Green Left could overtake the Greens group in number of seats, putting the latter in fifth spot as a political force in Europe. The European elections will be held in all EU countries in May 2014. The Lisbon Treaty states that the European Parliament elects the Commission president on the basis of a proposal made by the European Council, taking into account the European elections (Article 17, paragraph 7 of the TEU). This will apply for the first time in the 2014 elections. The European Parliament, parties and many others have pushed for these parties to nominate their frontrunners in the election campaigns. This would make the European elections a de facto race for the Commission presidency, would politicise the campaigns and could increase voter turnout, they say. In the coming weeks, all mainstream parties will clarify the common programmes or ‘manifestos’, on which to base their common campaign and for national parties to use in national campaigns. >>Background reading: our LinksDossier on the elections; on EU top jobs. Is there some difference between this “Green New Deal” and the “Green New Deal” that was the base of the U.S. Green Party policy during the 2012 Presidential Elections? If so, what is that difference? If it’s virtually the same, why not state that, and further, why not explore the possibility of forming an International Green New Deal? The aims and goals are certainly unified in the sense that our choices, especially re our interaction with the environment, have an ultimate global impact, regardless of any man-made divisions as to country. If we’re to have any significant environmental improvement, it would likely be due to a global effort. So while the adage “Think globally – act locally” stands as a solid principle, it won’t work without BOTH parts of that equation being present. The present state of U.S. governmental policy is currently THE most destructive influence and instigator to our growing global catastrophes. But the U.S. Green Party shines all the more brightly in its direct opposition to practically every facet of those present policies. The French Greens obtained 15 seats in 2009 because of the fact that the list leader was Dany Cohn-Bendit. I know this because I voted for him for that reason – and not because it was the Greens, for whom I don’t have even five minutes of the time of day to give. This time, it will be the new list Nouvelle Donne, because the French Front de Gauche part of the European United Left has fallen into politicking even worse than that of the French Greens.